The Turtle Bay Exploration Park & Museum exhibit, “Staff Picks” (Through April 30, 2017) is a grouping of objects from the permanent collection, chosen by staff members from all backgrounds and positions within the organization. It includes a wide variety of objects including fashion: a fur coat, a flapper dress, a Victorian hat, ski’s and boots, ballet slippers. Not surprisingly, my ‘pick’ was clothing related. Since so many staff members choose garments, I decided to try something a little more technology related: a curved needle sewing machine. Wheeler and Wilson Ad from “California Farmer and Journal of Useful Sciences,” San Francisco, February 28, 1862. Thomas Saint is credited with inventing the first sewing machine in England in 1790. Some years later, it was refined by Barthelemy Thimonnier in France, who patented a new version used by the Army in France in 1831. In the 1830s, a New York-based Quaker named Walter Hunt, continued to refine the sewing machine. He began selling machines in New York around 1832-1834. Many manufacturers and inventors began to innovate and patent various mechanisms and sewing machine parts after this time, including the now-well-known Singer. Ad from “Pacific Rural Press,” Volume 8, Number 3, 18 July 1874. The example at Turtle Bay is by Wheeler and Wilson, a direct competitor to Singer. Wheeler and Wilson’s first patent was registered on November 12, 1850, and they began selling machines in 1851 in Connecticut, producing machines up until about 1909. The curved needle sewing machine was favored over the straight needle machine as some thought it worked better for light fabrics, and was popular for shirt-making. By 1864 Wheeler-Wilson’s had “Bridgeport factory was producing 40,000 machines a year, almost double that of Singer. 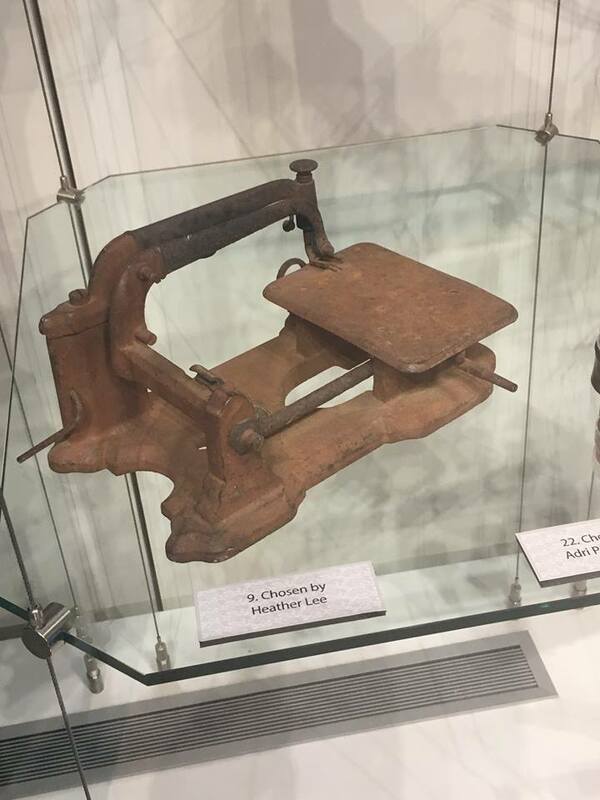 Wheeler and Wilson would continue to lead or match Singer in the rapidly growing sewing machine market for another five years, until the Singer marketing steamroller ran over them.” (Buckman, 67-68). Singer eventually took over the company in in 1905. 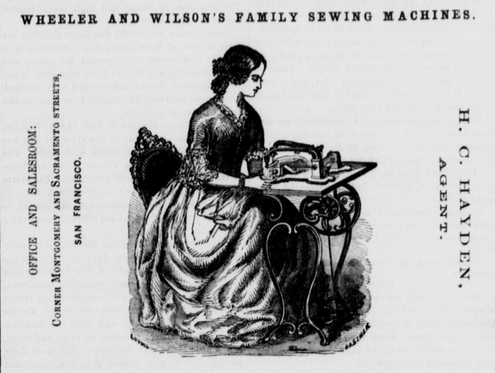 In Northern California, Wheeler-Wilson sewing machines were commonly used. Pioneer family Wills at Old Shasta had a beautiful, highly decorated Number 8 from 1872 (now on view at Old Shasta Historic Park). Advertisements appeared in the Pacific Rural Press and California Farmer, common resources for innovative farm and agricultural products, during this era as well. Detail of Curved Needle Sewing Machine, c1870s-1880s, Wheeler and Wilson Mfg, New York. 1964.4.2, Donor Gwyn Stalcup (Turtle Bay Exploration Park & Museum) Photo by Julia Cronin. It is challenging to date this rusty machine in Turtle Bay’s Collection: no serial number or model number are present. A serial number would help determine the date, and the model number would tell us what it might have been used for. [i] For example, a model number 8 was intended for light family use, while a number 5 was intended for shirt-making and sewing sleeves. The circular logo, however, provides clues. 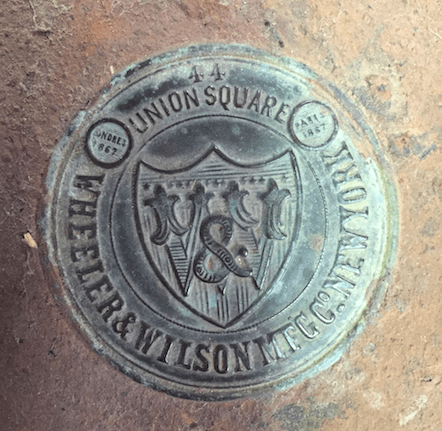 Logos were used on Wheeler & Wilson machines beginning in 1870. The address the label references is its sales center at 44 Union Square, in New York, suggesting a late 1870s to 1880s date. The base, a ‘slab’ style, was used between the 1860s and 1870s. Two illegible dates printed on the seal add to the mystery. These may be patent dates, international award dates, or office opening dates: 1867 or 1851 or 1862 (Londres) and 1867 or 1887 (Paris). Buckman, Jack. Unraveling the Threads: The Life, Death and Resurrection of the Singer Company, America’s First Multi-National Corporation. Dog Ear Publishing: Indianapolis, IN. 2016. Londres, the French, Spanish, Portuguese, Catalan and Filipino language name for London. SFSU Thesis Exhibition: Screenprint, art about the body, etc.